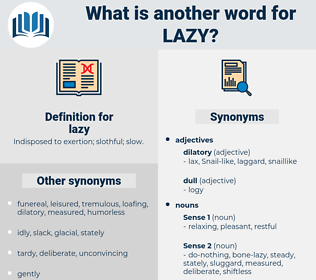 What is another word for lazy? 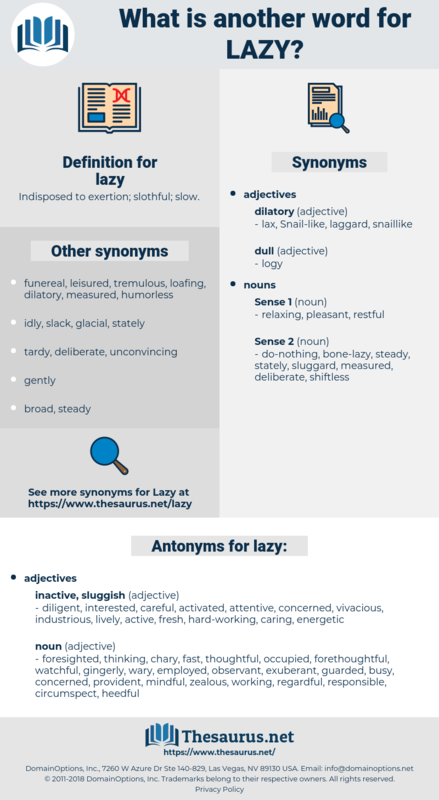 Indisposed to exertion; slothful; slow. diligent, interested, careful, activated, attentive, concerned, vivacious, industrious, lively, active, fresh, hard-working, caring, energetic. forethoughtful, employed, regardful, enterprising, provident, cautious, regarding, mindful, punctilious, thoughtful, occupied, thinking, gingerly, zealous, observant, fast, circumspect, foresighted, responsible, heedful, working, watchful, guarded, exuberant, busy, wary, chary, vigilant. It's mother who's dwining; and Alix, though she's such a lazy little beggar. Orman, you and Bob ride straight to the Lazy B. Harrison gave it out he was going to stop there for the night. lessee, log z's, loasa, lycia, lichi, lac, luck, lilac, laicize, lock away, lexis, laugh, lao-zi, losses, leakey, luke, liaise, league, lockage, liliales, low-key, Leo X, leigh, lxii, lxx, lac wax, lichee, Louis XI, Lusaka, lechwe, Louis Agassiz, lxxi, lackey, lazio, lass, lxxxii, luggage, loggia, lose, luge, lough, lag, laze, less, liza, loco, louche, llullaillaco, liege, laicise, leggy, lox, lascaux, lake, loss, loquacious, leo xiii, laos, legacy, luce, lxxx, lucy, leech, likewise, leash, lugosi, lasso, loloish, Louis Ix, loligo, lie awake, leakage, Lugh, lucky, lxxxiii, lock, lassie, lick, lousy, loge, leach, lacy, loxia, logic, lax, lucas, lux, Louis Ii, lxiii, laic, lxxxi, lagos, lek, laws, leo ix, logo, lees, leak, loos, louse, locus, lycosa, luxe, lake keuka, Louis X, laugh away, loose, laius, leg, leechee, lyssa, lug, Leo Esaki, leek, lycee, lace, lxxii, Lech, lewis, Lego, lockjaw, look away, louis, logy, leaky, lassa, lygus, leuciscus, lhasa, lollygag, look, lack, lachaise, logos, loki, Louis I, Liliaceae, luscious, lease, Lake Cayuga, lachesis, loach, Louis Xiii, lallygag, lewisia, legs, loasaceae, liliaceous, lash, lysis, like, lasix, lxxiii, lilylike, lychee, leacock, lossy, Louis Iii, Louis Xii, loess, lochia, loch, log, lawless, lx, locke, lakh, lxi, lisu, luik, lush.